This guitar originally came Maple and was equipped with a standard Rickenbacker 'trapeze' tailpiece/elongated jackplate/vintage Grover tuners/& correct rewound pickups with all new wiring. The middle pickup was disconnected. The guitar was stripped and refinished Jet-glo by myself and another local Rickenbacker collector who has a guitar shop as a part of his house. It sat for several months to cure before it was finally rubbed out. After all of the hardware was reinstalled on the guitar, I discovered that I had to remove approximately 1/4" off each of the pot stems so that the reissue 'Burns' knobs would fit down on the stems correctly! This was done by hand using a small hacksaw blade. Once again, be very careful doing this! I would advise anyone with this problem to remove the pot before attempting this modification. It is also currently equipped with 'slot head' pickup cover mounting screws, although I'm not entirely sure that this is correct for this 'Sullivan' model. 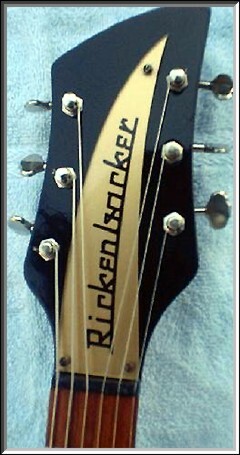 I still haven't located a pair of 50's vintage Rickenbacker strap buttons. I don't know if I ever will, but I'm always searching!! 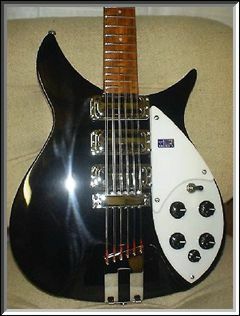 Needless to say, this is the guitar that should be available from Rickenbacker as the '325V58, Sullivan' model. A photo from an angle that features the raised pickguard, the elongated jackplate and the reissue 'Burns' knobs. It is really amazing just how much visual difference the extra 1/4 inch body thickness makes! Another shot that features the correct 1958 325 body thickness and all of the correct body hardware. 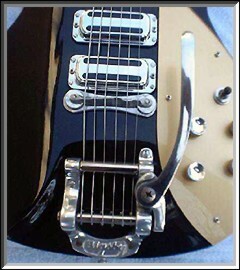 This close-up of the body shows the Bigsby tremolo with the correct unpainted black background Bigsby logo, aluminum arm, slot head mounting screws and the aluminum Bigsby bridge. 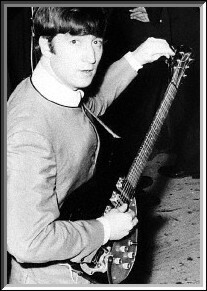 John Lennon with his '58 325 at the City Hall in Sheffield, November 2 1963. ©2000 Corbis Pictures. All rights reserved. Used by permission. screws. 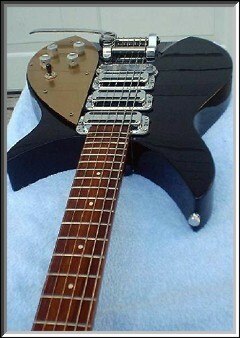 The 2 vintage bridges on my 1974 362/12 Maple-glo doubleneck are equipped in this same manner. 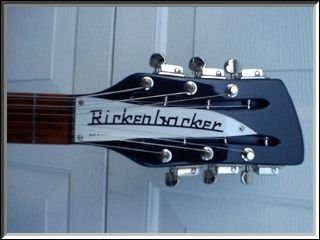 Many of the early to mid 1970's Rickenbackers were probably issued with vintage pickups/tuners/ & bridges. This is a picture that features the 325/12V63 headstock as it should have appeared from the factory. 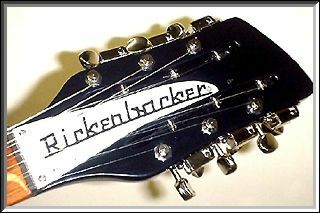 The "Rickenbacker" logo was reshaped into the style that was installed on John Lennon's 1964 325/12. The top factory mounting hole was filled in, touched up, and covered with a spot of lacquer. It was very tedious grinding down the logo plate & took quite a while; in fact, most of this was done by sanding with a medium grit sandpaper by hand. If you use a machine grinder on the headstock logo, be extremely careful as you can ruin it very quickly & these are almost impossible to replace! Be careful if you elect to use a grinder or electric sander on yours. 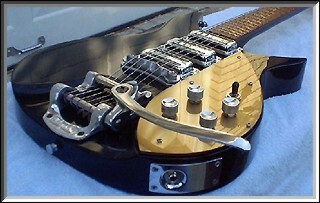 The "round" style tuner bushings that this guitar came with from Rickenbacker have been replaced with the "correct" style "Hex" style bushings that Lennon's 325/12 (and Harrison's '63 Fireglo Doublebound 360/12) were equipped with. If you modify your guitar, be careful not to use the "oversize" larger hex bushings that are available. These are not correct!! Take the time to find the proper standard tuner hole size hex bushings that are currently available via the Internet from most all guitar hardware suppliers. Otherwise you will have to re-drill the tuner holes in your headstock which you certainly don't want to do! 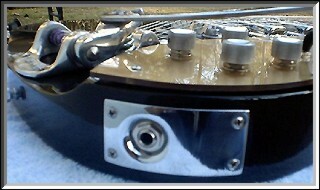 I also replaced the factory "RIC Deluxe" tuners with a set of "straight line" Kluson Deluxe tuners. These were the tuners that Lennon's '64 325/12 was most certainly equipped with. These correct tuners have also been reissued and can be purchased quite easily, via the Internet. Another small detail is that the "slot head" tuners/pick-ups/headstock logo mounting screws that these 325/12V63's came equipped with from the factory are the wrong size. They are too large. If you have a 50's or 60's vintage Rickenbacker, compare the vintage "slot head" mounting screws to the ones used on the new 325/12's; you will immediately see the size difference. The vintage ones are also made of plain steel, not stainless steel! The correct size steel slot heads are no longer available, not even from "Small Parts". I actually sent an example to them & they couldn't match it! In order to get the correct size screws, I would've had to place a custom order for thousands of them! Additionally, the location of the rear strap button is wrong on these 325/12V63's. It should be located more to the back of the guitar rather than right in the middle of the body. bushings & the correct thick string nut. This is the headstock of the 325/12V63 before any of the 'Lennon' modifications were done. This is the original 325/12 from 1964.